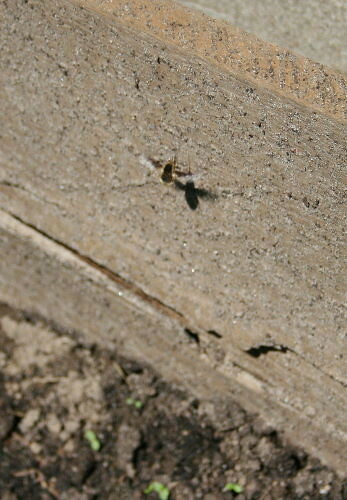 I discovered this bee fly hovering along the side board of my raised garden bed a couple of days ago. 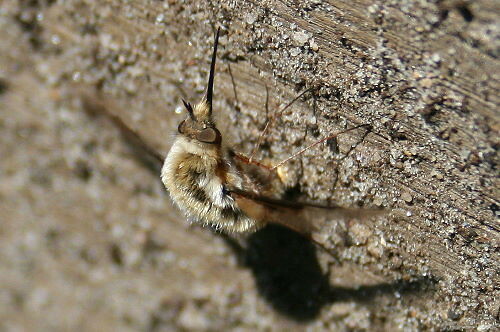 It’s a Greater Bee Fly, Bombylius major, as told from the plump, furry golden body and the wings with dark fore-halves. I found the observation interesting for two reasons. First was simply the timing. The BugGuide page for B. major notes that the species can be found “from March to May (most common in April)”. Well, here we are at the end of May; it seems a little late for these guys to still be about. In fact, in thinking back on it I’m pretty sure that all of my previous encounters had been early spring. This is probably the latest I’ve seen the species by a few weeks. The second was what the fly was doing. While the adults use that long proboscis to sip at nectar, the larvae are parasitic on the larvae of mining bees. I knew this, so I found it puzzling to watch the fly doing what appeared to my unaided eye to be laying eggs. It would hover in front of the board for just a moment and then land for a few seconds, pressing its abdomen against the board repeatedly while it hung there; can you see that yellow bit at the end of its abdomen, against the board? As I leaned over, peering at it while it did its thing, that little bit of light colour caught my eye so I could observe how the abdomen was being moved. Then it would pop up again, move over an inch or two, land and press its abdomen to the board again. If it wasn’t laying eggs, I don’t know what it was doing. But why would it have been laying eggs on the boards of my raised bed? I don’t know if the flies lay their eggs directly on the host, or if they lay them in the ground or on a surface and let their maggots find the hosts; perhaps if the latter, it was doing that? I find behaviour one of the most fascinating aspects of nature (alongside web-of-life level ecological connections), but it’s also one of the hardest to get answers for, especially since you can’t just ask the organism, “why are you doing that?” Anybody want to offer a hypothesis on this guy (gal)? Hi, Seabrooke. Great post!! I too really enjoy observing wildlife behavior… but, like you, I’m often left with more questions than answers. I’m not at all sure what your bee fly was up to. From what little I read on the subject, it seems as though they are most likely to flick their eggs into (or very near to) the entrance of the mining bee nest itself. If the hatched fly larvae need to travel to find the bee larvae, I’ve gotten the impression they don’t travel very far. Still, the description that you gave does sound very much like bombyliid egg laying behavior….soooo, I guess I’d be scratching my head too. I know this one! She is packing sand into a special chamber in her abdomen. Females lay eggs by flicking them, while hovering, into the nest chambers of solitary bees, which are usually little holes in the ground. The sand is thought to either add heft to the eggs, or help prevent dessication (while still in the fly, awaiting launch, or while in the burrow? I don’t know.). I’ve seen another species pack sand in exactly the same manner — from a wooden plank. Maybe they need single grains on a hard surface. Great observations and photos — and fantastic that we got an explanation. Fantastic! Watching flies in the yard has become a hobby for me. It seems like it will take a lifetime to figure out what in the world they are doing.